Some ingredients boost SPF but don't offer more protection. 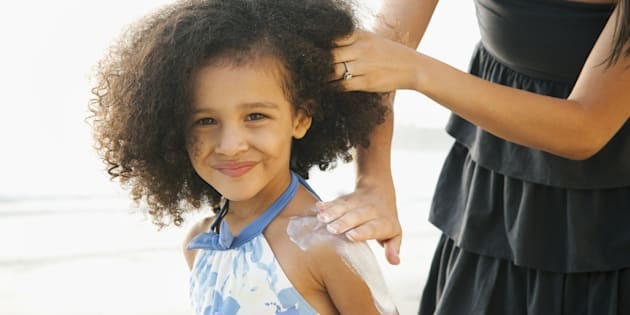 Parents trust that the sunscreen they buy for their kids is safe, but a new report by the Environmental Working Group (EWG) proves that's not always the case. According to EWG's 2018 Guide to Sunscreens report, some sun lotions contain ingredients that boost SPF, but do little to protect children from the sun's harmful rays. "People select products based on their SPF, or sunburn protection factor, and mistakenly assume that bigger numbers are better," EWG senior analyst Sonya Lunder told Parents.com. "Consumers think that they'll get twice as much protection from an SPF 100 sunscreen as from an SPF 50 product." This is a common misconception, as some products with high SPF that were tested in EGW's report contained chemicals like retinyl palmitate (a form of vitamin A that can damage skin) and oxybenzone (a hormone disruptor). Specifically, the report found that two-thirds of the 650 tested sunscreens contained the latter chemical. While EWG's website notes that oxybenzone can be detected in nearly every American, sunscreens that contain the chemical can soak into the skin and impact the endocrine system (a group of glands that create hormones), the org's senior scientist David Andrews told HuffPost. Oxybenzone can also be harmful to the environment and has been known to damage and kill coral reefs. That's why Hawaiian lawmakers passed a bill earlier this month banning sunscreens containing the chemical. So what are the worst sunscreens for kids and babies? Common brands like Neutrogena and Banana Boat topped the worst list, according to EWG's report. Panama Jack Sport Sunscreen, CVS Health Sun Lotion, and Up & Up Sport Sunscreen also made the list. Neutrogena Pure & Free Baby Sunscreen, SPF 60+: Not only does it contain retinyl palmitate, but also methylisothiazolinone (a preservative associated with allergic reactions), which can cause skin irritation. Banana Boat Kids Sunscreen Lotion, SPF 100: The SPF value is misleading and offers poor UVA protection in relation. Ingredients such as oxybenzone and its fragrance cause high health concerns as well. Banana Boat Kids Continuous Spray Sunscreen, SPF 100: EWG believes the SPF advertised is inaccurate and notes that the spray-on product may not offer complete coverage of the skin. Product also contains oxybenzone. Panama Jack Sport Sunscreen Lotion, SPF 85: SPF value is lower than advertised. Product also contains harmful ingredients such as oxybenzone and the skin allergen methylisothiazolinone. Up & Up Sport Sunscreen Lotion, SPF 50: This sunscreen only offers moderate protection in relation to its SPF. Also poses moderate health concerns over its ingredients. Last year, there were health concerns over Banana Boat products causing burns to children's skin, and Health Canada received more than 187 complaints of this nature, CBC reports. While the sunscreen company conducted tests and found their products to be safe, it noted that the skin reaction could be triggered by its ingredients and made worse with sun exposure. EWG warns parents to be wary of sunscreens with high SPF, as people "trust these products too much." Not only can high-SPF products pose greater health risk due to their ingredients, but those who use these products tend to overexpose themselves to the sun, believing they are well protected. "In reality, the extra protection is negligible," senior analyst Lunder explained to Parents.com. "For example, an SPF 50 sunscreen that is properly applied will block 98 per cent of UVB rays; an SPF 100 sunscreen will block 99 per cent. In reality, people rarely apply enough sunscreen to achieve this level of protection." Lunder added that sunscreen should be applied once every two hours and that "sunscreen with SPF values in the range of 30 to 50 will offer adequate sunburn protection, even for people most sensitive to sunburn." What are the best sunscreens for kids and babies? The report found mineral-based products that contained ingredients like zinc oxide and titanium dioxide received a good rating in their analysis. This coincides with advice from New York-based dermatologist Dr. Bobby Buka, who told CTV last year that sunscreen "should have zinc or titanium in it – one of those two is a great physical blocker, stays on and lasts a long time." According to EWG's report, the best-rated sunscreens — which included Neutrogena Pure & Free Baby Sunscreen, SPF 50 and Aveeno Baby Continuous Protection Lotion Sunscreen, Sensitive Skin, SPF 50 — provided a good balance of UVA and UVB protection. They also did not contain any harmful additives. Visit EWG's website for the full list of best sunscreens for kids.